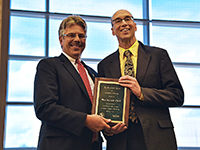 Two School of Pharmacy faculty members were honored with President's Awards for Faculty Excellence at Duquesne University's Annual Faculty Reception and Awards Ceremony on September 7. 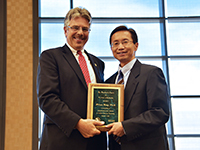 University President Dr. Ken Gormley presented Dr. Marc Harrold, Professor of Medicinal Chemistry, with the 2017 Award for Excellence in Teaching; and Dr. Wilson Meng, Associate Professor of Pharmaceutics, was presented with the 2017 Award for Excellence in Scholarship. The President's Faculty Awards for Excellence are the highest awards that the University grants to faculty members. The Awards recognize distinguished contributions to the University in three areas: scholarship, teaching, and service to the mission of the University.